Targus Rolling Notebook Backpack 15.6'' (TSB700) | Seguro e fácil com entrega ao domicílio. Targus’ first Rolling Notebook Backpack combines the best of both worlds. At first glace you can see that it is a stylish, durable backpack with plenty of features but look a bit closer and you can see that it is also a roller. The TSB700 glides on in-line skate wheels and includes a 2-tier telescoping locking handle for easy navigation. 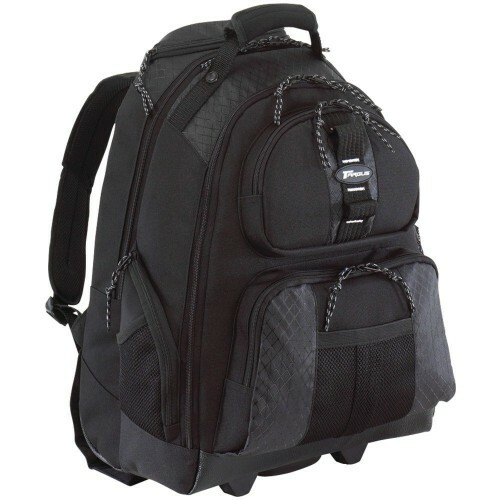 A protective rear flap holds the shoulder straps in place when using it as a roller, then lower the flap to cover the wheels for greater comfort when in backpack mode. For additional convenience it has a handle grip on the bottom of the case that allows for easy lifting into your car or an airline overheard compartment. Other features include a padded, removable slip case for notebooks with up to 15.4” screens, top front pocket with protective lining for iPod/MP3 players, PDA or sunglasses, bottom front pocket with business card holder, pen loops and key clip, a main compartment with plenty of file and accessory storage, a large side pocket, even a side mesh water bottle holder. Stylish, practical and ready to go, this case has it all.